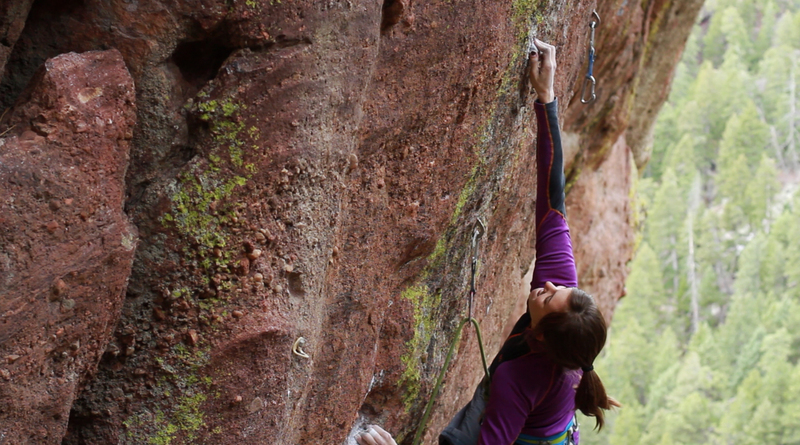 Confidence is a rarity in the climbing world. Many may disagree, using facebook send spray, blogs, and shirtless machos in gyms as counterevidence. However, perhaps these things are signs of egos, which in fact lack confidence. I know I’m guilty of more than one of the aforementioned offenses. It’s not that these things are always bad, but they often turn into forced displays of prowess, like a peacock, except less elegant. For the last year, or maybe more, I’ve suffered from a lack of confidence in my climbing. In short, I haven’t sent anything and I’ve grown frustrated with myself. This little conundrum is due, in part, to my preference for projecting. I fixate on one route and return over and over for days, weeks, and even seasons. This can be rewarding, and is often the path to break through grade barriers. However, I’m learning that projecting must be balanced by “play time” on other, often easier routes. Projecting at your limit, be it 5.10 or 5.15, is a physically and mentally exhausting process. While in the presence of patient friends and a beautiful setting, it can be enjoyable. But too much time spent on one project eventually leads to weakened muscles and, more often, a weakened spirit. We give up training, cross training, and easier fun routes, in order to push all our energy into one project. We may emerge as experts at the one route we try, but all others thwart our efforts. If we don’t succeed, aggravation makes its home in our minds. After a year of working on the same route, I’m tired of failing. I feel strong in the gym, I’m improving at campusing, and muscle memory can pull me up to the last moves of my project. But on any other route outside, I wobble, slip, and embarrassingly, sometimes I cry. More devastating than the loss of physical strength is the confidence that seems to have escaped me. My stubbornness to only climb on one route means I haven’t clipped chains in…too long. As I’ve grown as a climber over the last few years, I’ve skipped grades. I did one 13a and one 13c before climbing 5.14. Now, my expectations are high and my performance isn’t living up to those standards. So I’m stepping back to the start in order to “build up a ladder”. It’s a humbling process to work routes I could have previously onsighted. But I’m reminded that climbing is full of ups and downs, periods of success and periods of disappointment. 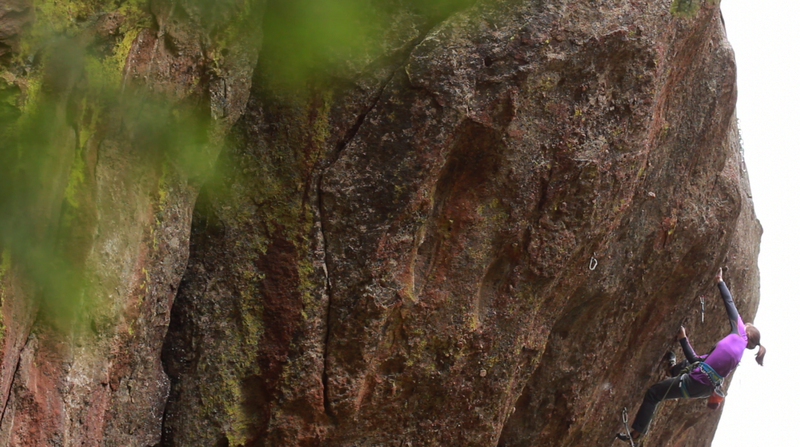 Fortunately, Boulder is full of more classic 5.13s than 14s, so building up the ladder should actually be fun – I get to explore the routes I would usually pass by. And to no one’s surprise but my own, these old school Colorado lines are HARD! Slave to the Rhythm, a Flatirons cobblefest. Jon Glassberg screenshot. Slave to the Rhythm, 5.13b. Jon Glassberg screenshot. Now, at least for a while, I just want to climb. No matter the grade, if I feel challenged and the route looks worthwhile, why not give it a go? My friend Lisa Hathaway recently introduced me to the “consolation prize” – in case you don’t send, have a fall back so that you still end the day happy. Even small successes help build confidence. Sounds like the perfect storm. Blankety Blank, V6. Big Bend, Utah. A Lisa Hathaway iphone masterpiece. Well said, Paige! Thanks so much for sharing your experiences… Always nice to hear a real voice amidst all the chatter! So here’s a question: when I ran track (a long time ago) I was making at least some attempt to “peak” my training, and since there weren’t meets the entire year I sort of could- but I find myself climbing pretty much all year long, making “peaking” impossible. Is this true for you, and if so, is that a factor in the frustration you’ve been having? Peter, I think you’re definitely right. I find it hard to train to “peak”, for a number of reasons. It’s hard to back off when motivation is high or a project takes longer than expected. I also think that climbing is so specific to each individual that it takes a while to whittle down the training cycle that’s just right for you. I’ve been experimenting a bit lately with campus and running cycles, with hopes to wear my body down, rest, and grow stronger. If you have any advice, I’d love to hear (particularly with running, a personal weakness for me). See you at the gym!